Tim McCanna: BITTY BOT Cover Reveal! 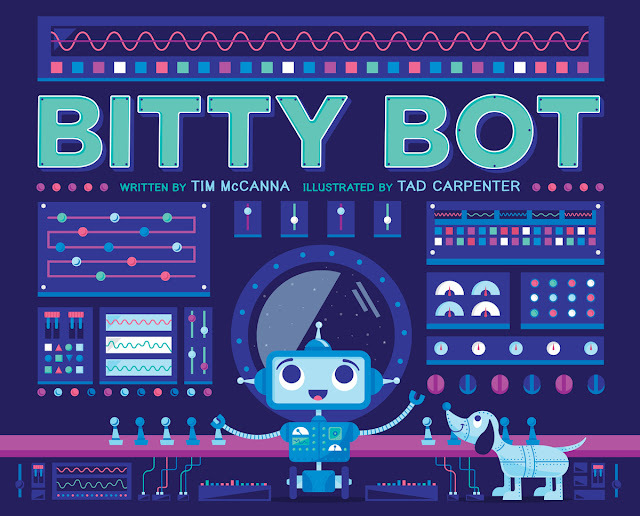 I am so happy to finally share Tad Carpenter's beautiful and delightful cover art for BITTY BOT, my first picture book with Simon & Schuster / Paula Wiseman Books! They say not to judge a book by its cover, but forget that. I can only promise that it's merely the tip of the robot iceberg. Every page inside BITTY BOT is filled to the brim with Tad's incredible, colorful artwork, including tons of super fun details for young readers to discover. I just can't wait to read this book aloud with kids! Aaaah! WARNING. WARNING. EXCITEMENT OVERLOAD. BITTY BOT touches down October 4, 2016 at a bookstore near you.